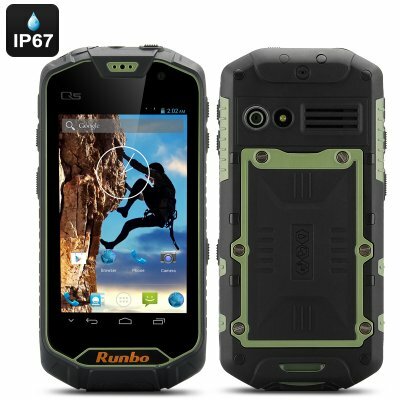 Successfully Added Runbo Q5 S Android Rugged Smartphone - IP67 Rating, Gorilla Glass Screen, Quad Core, 1GB RAM, 8GB Memory, Walkie Talkie (Green) to your Shopping Cart. The Runbo Q5 S is muscling its way to the forefront of rugged mobiles and comes as the successor to the popular Runbo X5 model. It features an MTK6589 Quad core processor that is based on 28 nanometer technology to achieves speeds up to 1.2GHz. When combined with the 1GB or RAM it offers better overall performance than the X5+ model. Like all Runbo products the Q5 S has been built with high quality materials and a tough and ready exterior that provides this Smartphone with an IP67 rating. It has been tested for dust and water ingress and was able to withstand being submerged in up to 1 meter of water for up to 30 minutes so you know its ready for anything. With a 4.5 inch touch screen that display in 1280x720 resolution your able to enjoy games and or movies alike and to protect against scratches and damage its protected by the world renowned Gorilla Glass, so you get great protection and resilience. This phone is a master of communication as it has two SIM slots as well as 3G support. If that wasn’t enough you can use the accompanying RF antenna and turn this rugged Smartphone into a Walkie Talkie device. It can support Ultra High Frequencies (UHF, 400-470 MHz) so you can communicate over UHF frequencies even if there is no mobile signal. A great outdoor device should have multiple uses and the Runbo Q5 S has that in spades. With GPS/AGPS support you can use any number of apps to pinpoint your location when out and about so even if your well of the beaten track you won’t get lost with the Runbo Q5 S in your pocket.